Toronto, October 20, 2015 – Canadian Feed The Children’s (CFTC) Resilient and Sustainable Livelihoods Transformation (RESULT) project’s fish farming initiative is catching attention in the Upper East Region of Ghana. The Pusu Namongo aquaculture group, a group of farmers in the Upper East Region of Ghana who are supported through CFTC’s implementing partner ACDEP, was been nominated as the best aquaculture group nationally and regionally. CFTC and ACDEP were featured in a recent Ghana News Agency article highlighting the impact the fish farming initiative is having on local communities. Fish is a major source of protein in Ghana; fish consumption per person is one of the highest in sub-Saharan Africa, and Ghana imports significant quantities of fish to meet domestic demand. Many smallholder farmers eat fish as a main protein in their diet, sometimes more than five times per week – almost all of which was purchased rather than produced. In the northern region of Ghana, which is arid, there are still numerous water bodies because of dams and dugouts. Small-scale fish farming is an important potential opportunity to increase fish production, generate income and provide a significant nutritional source of protein for many poor rural communities. 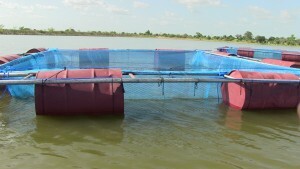 To support fish farming, RESULT provides groups of farmers with the materials required for one cycle (six months) of production: small-scale fish cages and related equipment and “fingerlings” (juvenile fish). Each fish cage is stocked with 7,000 fingerlings, of which 5,000 are expected to survive for harvesting and sale or consumption. The two species that are provided are the Nile tilapia and the African catfish – fast-growing and less susceptible to disease, in great demand by the market, and which provide higher nutritional value. The revenue from sales from the first cycle is used to restock the cages for another production cycle. Beneficiaries are given training on fish feeding, marketing, numeracy and literacy. Over 1,000 farmers in the Upper East Region of Ghana have benefited from aquaculture production from RESULT. RESULT helps farmers in northern Ghana produce more food for their families, generate higher and more stable incomes from diversified sources, and establish a threshold of resilience from which they can not only resist environmental shocks but also pursue more market-oriented growth opportunities. In July 2015, CFTC was selected by Canadian NGO Canadian Hunger Foundation (CHF) to assume responsibility for RESULT in northern Ghana and Market-Led Improved Livelihoods in Eastern Amhara Region (MILEAR) in Ethiopia with generous funding from the Government of Canada. These projects have scaled up CFTC’s impact and reach to an additional 160,000 direct beneficiaries.